So who do you trust the most?, Trains or planes? , both have a history of crashing but trainwrecks have always been used as a metaphor for something going really bad and often said when speaking of a person or a broken item and so on, OMG THAT D00D THERE’S A TOTAL TRAINWRECK!! !… umm..
DLC codes got off on rough start, huge companies decided to launch part of already finished games to the gamers out there and then do “day 1” DLC codes which you had to pay extra for course and they tried to lie to the gamers out there that the game wasn’t finished when the disc went to the press… lies, lies and more lies as hackers and magazine reviewers confirmed that the data was there already (on the disc) but it was deactivated and one had to have a code to enable it and that was the reason why the DLC code was like 1 Megabyte. 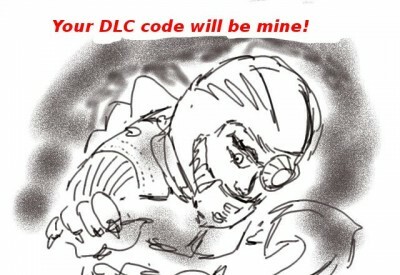 Picture Above: OMG IT’S A DLC CODE!!!!!!!!!!!!!!!!!!! EXCLUSIVE!!!!!!!!!!!!!!!!!!!! I can see the next Activision marketing campaign on their games, FREE CODE FOR CALL OF DUTY 12 included! or Electronic Arts who have Online Pass (yes i know they stopped for now with them) in FIFA 15 for FIFA 17 if you buy all their games!!!…. I might sound like i am going way out of line here but do you know what? , you might think it sounds crazy now but what about 2 years from now? So yes i bought the standard Ground Zeroes version, nothing fancy but it was marketed with stuff like “EXCLUSIVE MATERIAL INCLUDED” and so on… that cover is absolutely amazing so even though this is a rant about DLC i still want to say that i am happy i bought it anyway. Sorry m8, I couldn’t resist adding some “rant art”!